The Curious Wavefunction: Book review: Andrea Wulf's "The Invention of Nature: Alexander von Humboldt's New World"
Book review: Andrea Wulf's "The Invention of Nature: Alexander von Humboldt's New World"
If I ask my learned friends to make a list of the top ten scientists in history, Alexander von Humboldt probably won't figure on the list; he probably wouldn't have figured on my own. And yet when he was alive, for a while Humboldt was the most famous scientist in the world. Thousands thronged to hear him speak, and the most distinguished personalities of the age visited him at his home in Paris and Berlin. He was a polymath in the true sense, excelling in science, philosophy, writing and adventure. He also laid the foundations for modern environmentalism and inspired scores of later writers and naturalists, including Charles Darwin, Henry David Thoreau, George Perkins Marsh and John Muir. Dozens of streets, mountains, forests, universities and scholarships around the world are named after him. Andrea Wulf has written an excellent biography of this remarkable mind which secures Humboldt’s place both as a brilliant scientist and explorer and as one of the founding fathers of modern environmentalism. It would not be off the mark to say that he paved the way for Darwin and natural selection. He was born in Prussia in 1769, when Europe was starting to crackle with reform and intellectual ferment. Humboldt inherited a large sum of money from a strict, authoritarian mother who wanted him to enter the law and civil service. But Humboldt was smitten by nature and exploration from a very young age and wanted nothing more than to travel to the far, wild reaches of the planet. His brother Wilhelm on the other hand took to law and diplomacy like a fish and held a succession of important ambassadorial posts in France and Italy; throughout their lives the brothers along with Wilhelm’s wife Caroline were to be close, in spite of their occasional disagreements. In his young days Humboldt’s scientific temper was molded by a short career as a mining inspector. This career gave him a chance to travel throughout Europe and appreciate some of the finer details of geology and the chemistry of minerals. Humboldt's early intellect was shaped in part by his own burning curiosity for reading and nature and in part by a formative friendship with Goethe; the two often visited each other and spent long evenings debating everything from science to poetry. Until Humboldt met Goethe he was a strict rationalist, but Goethe taught him that a true appreciation of nature comes when its scientific study is infused with a sense of wonder and feeling about its workings. The heady mix of Romanticism and Enlightenment thinking that pervaded Humboldt’s discussions with Goethe primed Humboldt for a novel appreciation of nature. Armed with these twin pillars of natural philosophy, Humboldt set off in 1799 on what would turn out to be the most important trip of his career. He decided to traverse as much of South America and especially Venezuela as he could. His goal, just like Darwin's twenty-five years later, was to study the native flora and fauna, including the mighty river systems of the South and the indigenous tribes. Humboldt was accompanied by a French botanist named Aime Bonpland who shared his enthusiasm for adventure and science. And what adventures they had. They climbed mountains in freezing weather and hailstorms, navigated rivers and forests filled with dangerous snakes, crocodiles, scorpions and spiders and came face to face with ferocious tribes who had never seen a European before. The duo’s hardiness – some would call it foolhardiness – in the face of extreme weather and dangerous conditions alternately evokes a sense of bravery and stupidity. The most vivid experience they had which really stood out for me was when they trotted in horses in a pool filled with electric eels so that the dangerous creatures would be roiled up to the surface by the horses’ hooves, ready for capture and study. Humboldt’s South American adventures took five years and planted seeds for two key ideas which laid the foundations for similar thinking by many of the world’s most important scientists, humanists and writers. Traversing diverse environments like mountains, rivers, oceans and rain forests, Humboldt was struck by the similarity in flora and fauna that he observed; many of the plant species at higher altitudes for instance were similar to ones he had seen in Europe. At the same time he also observed how crucial the dependence of life in these environments was on climatic conditions. These observations led Humboldt to conceive of life as a seamless whole whose parts are critically dependent on each other; perturb one part and you risk perturbing the whole. Without giving it a name Humboldt had discovered the biosphere. This was a profound insight in an age when the environment was considered as a limitless resource that was ripe for man’s taking. The sensitive dependence of various parts of life on each other was a novel idea at the time, and it became the precursor for much thinking on ecology, biology and climate change that we take for granted; it underlies for instance James Lovelock’s idea of Gaia, of seeing the earth as a living and breathing organism with interdependent parts. Humboldt also acquired a lifelong disdain for colonialism and slavery during his American sojourn. By the time he arrived in Venezuela the Spanish had already established a sizable stronghold in much of the continent. Humboldt was struck by the plight of both the natives and the lowly status of the Spaniards who were born in the exploited countries. He also appreciated the wealth of knowledge that infused the way of life of the indigenous tribes and their ancient civilization; a way of life that was slowly being eroded by the Conquistadors. Humboldt got a further opportunity to shape his thinking on these issues when he made his way to Philadelphia and Washington DC in his way back home. His goal was to meet Thomas Jefferson. Jefferson had already heard of Humboldt’s observations, and he thought Humboldt’s notes on South America and Mexico would be especially helpful to him as the United States sought to expand its territories in the South and the West. The two men struck up a warm, cordial relationship. The president and the scientist-explorer had much in common; they were both polymaths and leading intellects whose thinking was permeated by an appreciation of nature and exploration. Humboldt stayed at Monticello and admired Jefferson’s experiments in agriculture and architecture. He also found much to admire in the forward-looking and spirited Americans. But he also openly criticized slavery in the United States and made the obvious observation that the founding ideals of the country were in stark contrast to its exploitation of other human beings. These discussions made Jefferson uneasy but it did not affect the intellectual relationship that the two men enjoyed. Humboldt arrived back in Paris to thousands of spectators; stories of his adventures and his vivid writings had already made him famous. Paris with its museums and intellectuals was the place to be, and Humboldt developed friendships with several leading French scientists including the chemist Gay-Lussac and the paleontologist Georges Cuvier. But he also watched with dismay as, after what seemed to be a bloody but successful people’s revolution, Napoleon turned France into an empire-building state and semi-dictatorship. At the same time Napoleon did have some appreciation of science, so Humboldt could still work relatively unfettered in France. Humboldt’s most interesting friendship in France was with the South American revolutionary Simon Bolivar who was spending a short period in the world’s cultural capital after the death of his young wife, immersing himself in wine, women and song to recover from the grief. After meeting Humboldt, Bolivar had a renewed sense of urgency regarding the freedom of South Americans from the Spanish, and when he returned he started his incredibly resilient and successful campaigns for Latin American independence. While Humboldt thrived in France and wrote bestselling books on South America’s flora and fauna, his restless mind could not stop thinking of other places to explore. He set his sights on India and the Himalayas, and his determined sadly unsuccessful search is one of the great what-could-have-beens of the times. The culprit was the East India Company which had established a stronghold in India and whose express permission was needed to travel to the country. When Humboldt visited London – mobbed by famous scientists and crowds as usual – he tried to pull all the scientific and diplomatic strings which he could to secure passage to India. But the thorn in the East India Company’s side was his vocal criticism of colonialism, of which India was Britain’s self-proclaimed “jewel in the crown”; the Company would never agree to let this upstart intellectual who threatened to create a publicity nightmare for them enter India. Humboldt continued to try to get to India for the rest of his life, and one can only wonder what kind of perspicacious observations he would have unearthed had he been able to make the trip. If not India, Humboldt’s next choice was Russia which was still under the yoke of the Tsars. 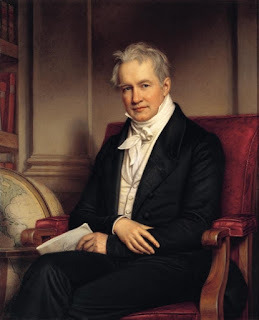 By this time Humboldt’s inheritance was gone and he was being funded by a stipend from the German King; it was a stipend that Humboldt grumbled about since it often involved accompanying the king on menial trips and small talk with court ministers. Humboldt was therefore gratified to secure funds from the Russian monarch. He was then 59 but still in his element. Accompanied by a few assistants and fellow scientists, Humboldt covered almost 10,000 miles in less than a month. The journey was again dangerous, and at one point involved barreling through a region stricken with an epidemic of anthrax. The official mandate of the trip was a mining exploration, but Humboldt often violated this mandate and strayed several thousand miles off the chosen route to perform his own experiments on the native flora and fauna. The result was again a view of the unity of life spread across diverse geographical and biological environments. Humboldt finally came home to Berlin after what turned out to be his last international trip. But his restless spirit was not done yet. He spent the next thirty years corresponding with leading lights like Darwin, Jefferson and Louis Agassiz. The crowning achievement of those years was a vast, multivolume, audaciously ambitious compendium of earth’s biosphere and the universe called “Cosmos”. Predating Carl Sagan’s Cosmos by a hundred and fifty years, Humboldt’s “Cosmos” sought to put all physical and biological phenomena on the same footing. Here was Humboldt the polymath at his best. In Cosmos Humboldt put together everything he knew about geology, anatomy, geography, paleontology, ecology and humanity to create a unified view of life. The volumes were lavishly illustrated with Humboldt’s own drawings as well as those from scores of correspondents. They were works not just of science but of literature, stamped with the influence of Goethe and the age of Romanticism. The volume of letters that Humboldt received from both scientists and fans during this time reached into the thousands. “Cosmos” was Humboldt’s last great work, and he died in 1859 at the ripe age of eighty-nine years, in his last years becoming one of the most famous people in the world. He was feted in all the world’s major capitals, and celebrations of his life lasted many days and drew crowds of thousands. The last part of the book charts the influence of this remarkable intellect on some of the best-known and most influential naturalists and writers of the nineteenth and twentieth century. Darwin found commonalities in his own observations of similarities among species and Humboldt’s work in Venezuela. Humboldt also had a great influence on Henry David Thoreau who took inspiration from Humboldt’s sensitive appreciation of nature in writing his famous ‘Walden’; Thoreau’s words exemplify the kind of poetry that Humboldt learnt from Goethe. The American naturalist George Perkins Marsh was also quite taken by Humboldt’s observations on the destructive influence of human activity on the environment, and especially on deforestation. Marsh’s “Man and Nature” anticipated Rachel Carson’s “Silent Spring”; Marsh today is regarded as America’s first serious environmentalist. Finally, John Muir whose wanderlust took him on foot from his home in Indiana to first Florida and then to Yosemite became America’s foremost influence on the founding of its national parks. Muir, Thoreau and Marsh all had heavily marked copies of Humboldt’s works on their shelves, and all extensively referenced Humboldt in their writings. What all of these naturalists and a horde of other successive writers gained from Humboldt was an appreciation of the unity of life, the seamless interdependence of its various parts on each other, and its great fragility and sensitivity to human intervention. As we debate climate change and greenhouse gas emissions, as we discuss nature’s depiction in art and poetry, as we pick up a snowflake and wonder at its multifaceted aspects of geometry and beauty, we are all walking in Alexander von Humboldt’s shoes.